Before I could effectively combat my home scorpion problem, I had to learn the fundamentals. I was so motivated by my scorpion obsession, that I learned all I could and became an expert on scorpions. I want you to know the basics about scorpions, so that I may help you rid your Arizona home of these pests. Scorpions are predatory arthropod animals. They have eight legs and are easily recognized by the pair of grasping pedipalps (pincers) and the narrow, segmented tail, carried in a characteristic forward curve over the back, ending with a venomous stinger. Scorpions are widespread and can be found on all continents except Antarctica. An outer layer on the body of scorpions makes them fluorescent green under ultraviolet light. Scorpions have a variable lifespan ranging from 2-8 years on average. They are nocturnal, finding shelter during the day in the relative cool of underground holes or undersides of rocks, and coming out at night to hunt and feed. Newborns are birthed live (not hatched from eggs). Litter average is 20, but could be 7-42. Females will court while carrying young. Scorpions are opportunistic predators of small arthropods and insects. They use their pincers to catch the prey initially. Depending on the toxicity of their venom and size of their claws, they will then either crush the prey or inject it with venom. Scorpions are effective predators, yet can survive many months without food. The females are often cannibalistic toward males after mating. 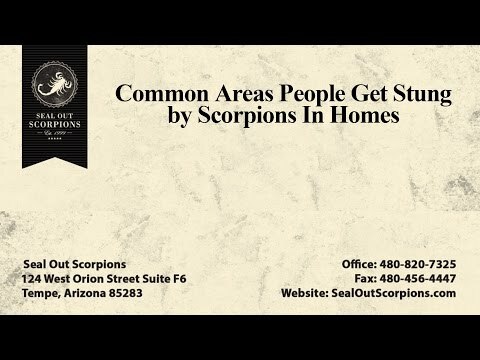 you are experiencing issues with scorpions in your home in Scottsdale, Gilbert, Chandler, or any other Arizona location, learn the basics and then have an expert help you get control of the situation. Our experienced scorpion control technicians have been in your shoes and are committed to bringing peace of mind to you and your family. We can get scorpions out and keep them out of your home! Contact us today to learn about our affordable financing options for full-service interior and Arizona exterior scorpion sealing.